Please note, these are the novelty spa/hotel slippers, and are one size fits all. Because of this, they may be long on small feet. We feel that these are best fitted for sizes 5/6 to 8/9. These Silver Glitter Bride Slippers are a lovely way to add to your bridal party outfits when getting ready for the ceremony. They are vinyl printed novelty disposable spa slippers. Select between standard designs, or opt for customisation to add your own design, along with names and logos. These slippers come in a standard “one size fits all”. 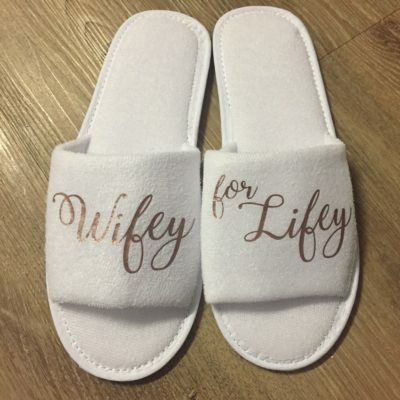 Along with making for lovely “getting ready” photos, these slippers also make for ideal gifts for the ladies in your bridal party. The lead time is approximately 10 working days. We offer nationwide courier and postal delivery options, as well as prearranged collection from Bloubergstrand.